I received product for review from Learning Resources. The opinions within this post are of my own and I was not influenced in any way. Please do your own research before purchasing products or using services. Your opinions and results may differ. Learning Resources is a leading manufacturer of innovative, hands-on educational materials for classrooms and learning toys for the home. They are headquartered in Vernon Hills, IL (a plus for being in my state) and their products are distributed in over eighty countries around the globe. I have worked with Learning Resources in the past and have been nothing but pleased with their educational toys and games. That's because anything I've received from them has been fun, high-quality, and educational (Shhh! Don't tell the kids the last part). I have numerous nieces and nephews in various age ranges whom I'm close to. I also have younger kids at my house when Small Group is held there on Tuesdays. When the kiddos come by to visit I like to have age-appropriate toys on hand for them to play with. The Pretend & Play® Teaching ATM Bank that I received from Learning Resources has gotten good feedback from the youths. The realistic, working electronic ATM bank helps children practice early math and money skills through fun, pretend play. It includes play money and features coin recognition and a mechanical bill feeder. The coins are plastic and include nickels, dimes, pennies, and quarters. The paper bills are in $1, $5, $10, and $20 denominations. Kids can process and learn how to add and subtract with this Teaching ATM Bank. Play money is included, but the ATM also recognizes real coins and bills. AA batteries are required for operation, and they are not included. Once you've installed the batteries, the machine works by pressing a button to turn it on. Kids can then use the plastic ATM card and place it in the card reader. Upon first use with the ATM card, a 4-digit PIN number can be created with the keypad. 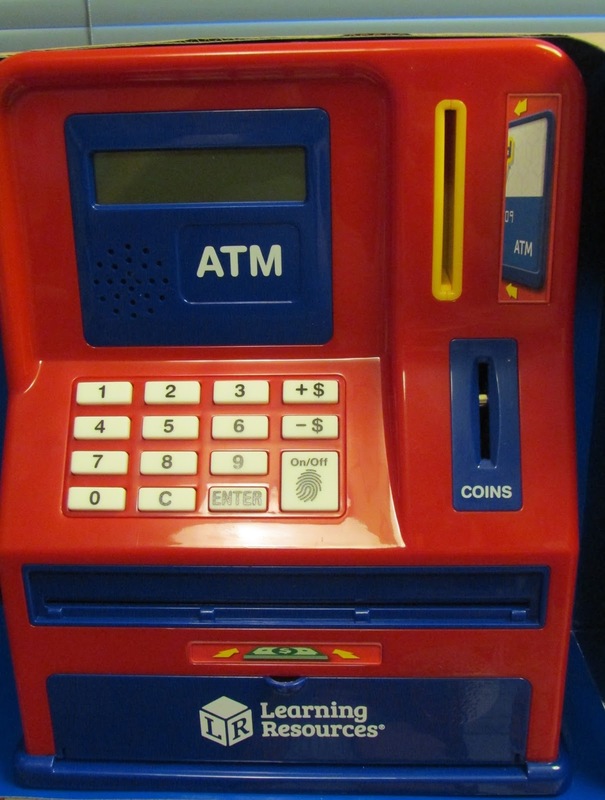 After first use, children can slide in the ATM card and enter their PIN to play. If your kids aren't great at keeping hold of all pieces of their toys (like every other kid in the universe!) they don't have to use the ATM card. They can use a card of the same size or wait a few seconds to bypass that step. When kids deposit either real or play money, the amount will automatically be added to their balance. The numbers are displayed on the LCD screen. Withdrawals can also be made, and that amount is deducted from their balance. The money is given via the bank vault. Again, the numbers are displayed on the screen. The machine makes sounds when deposits and withdrawals are made. If you prefer for the ATM Bank to keep silent, you can switch the sound off. 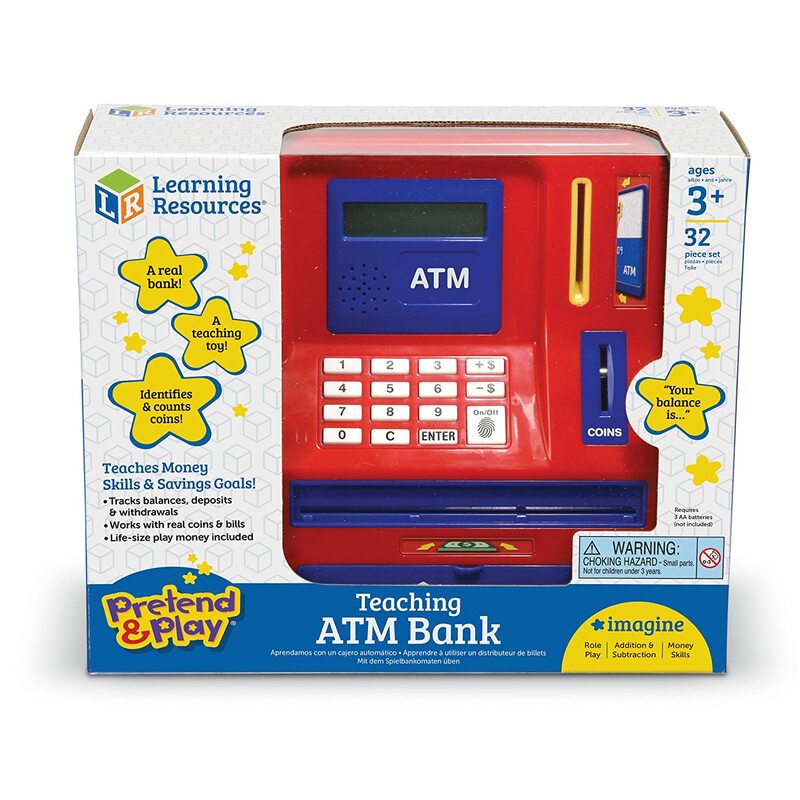 The Pretend & Play® Teaching ATM Bank is an exciting and fun toy that teaches children the concept of money. Lessons can be made on deposits, withdrawals, and coin recognition. One person will win a Pretend & Play® Teaching ATM Bank. I like the Pop for Addition & Subtraction™ Game. I love Math. My grand son would love the Sum Swamp™ Addition & Subtraction Game. The primary laboratory science set is cute! I would also love to have the Pretend & Play Calculator Cash Register for my daughter! She loves to play with money and this is a great way to introduce math! I also like the classroom clock kit. My grandson recently turned 4 and now his question seems to be ... when do I start school. I think Learning Resources's Pretend & Play® School Set with U.S. Map would be a big hit with him! I also like their Snap Cubes®, Set of 100. I love the New Sprouts Grill. How adorably cute and I love that it is compact sized. The Math Mat Challenge game would be great for one of my kids who is a very physical learner. I really like their Froggy Feeding Fun™ game! I like the Fraction Tower® Cubes: Equivalency Set! I like the Puzzle Globe, it looks neat and fun. I also like the New Sprouts Grill it! I love the Money Bags Coin Value Game, it's the perfect way to teach little ones the value of money. My Grandniece would love it! I really like the puzzle globe! Another item I like is the Pretend & Play Fishing Set. This would be a cute Easter gift. I also like the Puzzle Globe, it's so cool how the continents come off and all of the different things you can do with it. the teaching cash cashier seems nice. I like their gator grabber tweezers! The Zoomy Handheld Microscope looks like it would be fun! I like their Pizza Fraction Fun™ Game! I like the Math Mat Challenge Game. Gears! Gears! Gears!® Gizmos™ Building Set looks fun and at least a little educational! My youngest want the New Sprouts® Munch It! My very own play food. I like the dinosaur counters , set of 60, perfect to help with math and also for playing with. I also love the Classroom Clock Kit. It would be a great tool for teaching time. I like the Pretend and Play Snack Shop. I would like the Gears! Gears! Gears!® Motorized Spin & Glow Building Set for my grandson. I like the Smart Snacks® Counting Cookies, so cute! I like the Puzzle Globe! The Hide-and-go Moo is so cute. I like the puzzle globe. I like the mental blox game. I would also like to get the Gears! Gears! Gears!® Lights & Action Building Set, My son would have so much fun with this set! I LIKE THE Gears! Gears! Gears!® Motorized On the Move Building Set :) My son would love it ! I like the math mat challenge game. Thank you for the entry. My grandsons would just love their 150 piece set of Gears, Gears, Gears. The Deluxe Pink Building Gears! Gears! Gears! set! We would enjoy the Primary Science ViewScope. Item # LER 9220 is so cool, My little granddaughter would love the fact it spins. I Like the Reading Rods. I like the Jumbo Forest Animals and The Jumbo Insects. I really like the puzzle globe, it would be a good learning tool and fun to put together. The Word Whiz Electronic Flash Card sounds really cool too! My son would love the Primary Microscope! Snap-n-Learn™ Counting Elephants is a cute way to teach a tot to count to 10. I like the Minute Math Electronic Flash Card. Loving the take apart crane truck! I would also love to have the All About Me 2 in 1 mirror. I like the super sorting pie. Thank you! I like the set of Jumbo jungle animals: Mommas and Babies! My son would love the Gears! Gears! Gears!® Lights & Action Building Set. He's almost 5 and loves to build. I love laboratory science set for my son. That would be so much fun learning. I like the Jumbo Jungle Animals. I like the Create-a-Maze. I know a young boy that would really like that. I really like the super sorting pie! My grandson would love Gears!Gears!Gears! The Jumbo Dinosaurs would be a great hit with our learning of history! I like the Super Sorting Pie. My granddaughters would like the Primary Science ViewScope. The Gears! Gears! Gears!® Sweet Shop Building Set looks like a lot of fun. I heart the Cash Register. I also like the Pretend & Play® Fishing Set! I love the primary laboratory science set! I like the Stacker Crackers™ Sight Words Game. I think that the Pretend & Play® Cash ’n’ Carry® Wallet is cool. I love the Snap-n-Learn™ Rhyming Pups, they are so cute, my niece has them. I think the kids would love to play with the Froggy Feeding Fun™ game! I like the puzzle globe. I would definitely purchase something like that for my kids. I like the primary science viewscope. I really love the New Sprouts® Ring It Up Cash Register - My very own cash register! I also like the Pretend & Play® Animal Hospital. The puzzle globe looks pretty fun! The Light ‘N’ Strike Math Game looks great! I also love the Alphabet Acorns Activity Set! I like the Pretend & Play® Cooking Set. My grandson would also like the Teaching Cash Register. I like the Farmers Market Coloring Sorting Set.My granddaughter loves anything to do with the pushing buttons and money.I'd love to win this for her.